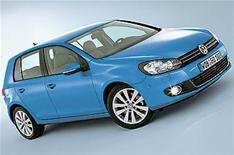 New VW Golf gets charity debut | What Car? The new VW Golf will make its UK debut at a charity ball. The organisers of the annual London Press Club Ball will reveal the car at their event on October 15 and then auction it to raise funds for the Journalists' Charity, which assists journalist, their partners or their dependents in need. Among the guests at the ball, which is being held at the Natural History Museum, will be 450 of Britain's most influential journalists and PRs. The evening will be hosted by BBC presenter Jeremy Vine. Ball committee chairman Philippa Kennedy said: 'It was a real coup to secure the next generation Volkswagen Golf as a prize. In the past we have had generous support from Audi, Honda and Peugeot providing cars as auction prizes. The charity auction is being conducted by Lord Dalmeny of Sothebys. Main sponsor is Barclays bank and the champagne reception is hosted by Camelot. Tickets to the event are still available, costing 250 per person, or with discounts for tables of 10 or 12 people. Phone 020 8429 7520 for details.